First Tumislah garlic and chutney until fragrant (plus carrots). Then enter mince / minced. Stir until the meat changes color. Then insert the chopped tomatoes, tomato paste and tomato sauce and stir well. Season with pepper, salt, sugar, powdered oregano and basil powder. Pour the water. Cook over low heat for 20 minutes. Lift. Set aside. First heat the butter until melted, then enter the flour. Mix well. Pour the milk slowly while stirring constantly. Take care not to bergerindil. Season with pepper, nutmeg and salt. Finally enter the grated cheese. Mix well. Cook until thickened with a small flame. Lift. Set aside. First Place meat sauce on a serving dish and then put the lasagna on top, flush again with meat sauce, then replace with a cheese sauce. 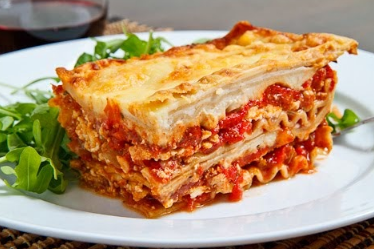 Place lasagna then back, then flush with meat sauce override again with cheese sauce. Begin to back it up. Last is the cheese sauce. Mozarela then sprinkle cheese on top. Recently Bake in oven at 180 ° C for 30 minutes until cooked, lift is completed. 0 Komentar Untuk "Second, Lasagna Recipe"